Nanotechnology has been named by the U.S. government as one of the most important areas of impending technology. It is a common view among leading professionals in microelectronics that current explosive developments in the field will likely lead to profound paradigm shifts in the near future. Identifying plausible scenarios for the forthcoming evolution of microelectronics presents a tremendous opportunity for constructive action today, especially since our economy and, indeed, our civilization seem destined to be irrevocably shaped by this technology. * With CMOS scaling coming to an end, what kind of research does the silicon industry need to continue its expansion? * What is the future beyond shrinking silicon devices? * Is there practicality in the fashionable topics like quantum computing, molecular computing, spintronics, and similar research trends? * What is the most likely future of microelectronics in the near and long term? In this compilation of original research, contributors from academia, government, and industry provide assessments of important new ideas and approaches. The result is a lively, intelligent presentation of diverse points of view that should be required reading for professionals and students in both the microelectronic industry and academia. SERGE LURYI is Leading Professor and Chairman of the Department of Electrical and Computer Engineering at State University of New York at Stony Brook. JIMMY XU is Professor of Engineering and Professor of Physics at Brown University in Providence, Rhode Island. ALEX ZASLAVSKY is Associate Professor of Engineering and Physics at Brown University in Providence, Rhode Island. Preface (S. Luryi, et al.). PART I: THE FUTURE WITH SILICON. 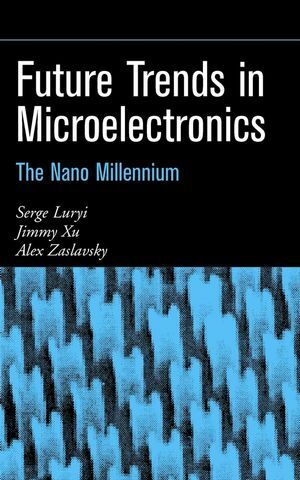 Microelectronics Technology: Challenges in the 21st Century (S. Sze). Trends in Microlithography (J. Benschop). Strategies at the End of CMOS Scaling (P. Solomon). Driving Technology to Re-Engineer Telecommunications (T. Smith, et al.). Rare Earth Metal Oxides as High-k Gate Insulators for Future MOSFETs (H. Iwai, et al.). Ultra-Thin Single- and Double-Gate MOSFETs for Future ULSI Applications: Measurements, Simulations, and Open Issues (D. Esseni, et al.). Future Silicon-on-Insulator MOSFETs: Chopped or Genetically Modified? (F. Allibert, et al.). Current Transport Models for Engineering Applications (T. Grasser & S. Selberherr). Advanced Physically Based Device Modeling for Gate Current and Hot-Carrier Phenomena in Scaled MOSFETs (P. Palestri, et al.). PART II: THE FUTURE BEYOND SILICON: SEMICONDUCTORS, SUPERCONDUCTORS, PHASE TRANSITIONS, DNA. FLUX-1: Designing the First Generation of 20-GHz Superconductor RSFQ Microprocessors in 1.75-mum Technology (M. Dorojevets). Silicon...Beyond Silicon: Beginning of the End or End of the Beginning? (I. Lagnado & P. de la Houssaye). Switching Device Based on a First-Order Metal-Insulator Transition Induced by an External Electric Field (F. Chudnovskiy & S. Luryi). DNA Conduction Mechanisms and Engineering (R. Zia, et al.). New Cold Cathode Paradigms for Vacuum Microelectronics Applications (M. Cahay, et al.). PART III: THE FUTURE ALONGSIDE SILICON: OPTICAL. The Evolution of Optical Data Storage (H. van Houten). Long Wavelength Quantum Dot Lasers: From Promising to Unbeatable (N. Ledentsov). Temperature-Insensitive Semiconductor Lasers (L. Asryan & S. Luryi). Trends in Semiconductor Laser Design: Balance Between Leakage, Gain and Loss in InGaAsP/InP Multiquantum Well Structures (G. Belenky, et al.). Terahertz Emitters Based on Intersubband Transitions (Q. Hu, et al.). The Future of Photovoltaics (M. Green). Infrared Detectors Based on InAs/GaSb Superlattices (M. Razeghi, et al.). Solid State Lighting (A. Zukauskas, et al.). Reduction of Reflection Losses in Nonlinear Optical Crystals by Motheye Patterning (A. Zaslavsky, et al.). Growth of III-Nitrides on Si(111) and GaN Templates: Challenges and Prospects (M. Sanchez-Garcia, et al.). PART IV: THE FUTURE WAY BEYOND SILICON: OTHER PARADIGMS. Quantum Computing: A View from the Enemy Camp (M. Dyakonov). Entanglement and Quantum Gate Operations with Spin-Qubits in Quantum Dots (J. Schliemann & D. Loss). Quantum Computation with Quasiparticles of the Fractional Quantum Hall Effect (D. Averin & V. Goldman). Photonics with Chips (A. Nurmikko). Metacrystals: Three Dimensional Systems of Interacting Quantum Dots (D. Johnstone). InGaAs/GaAs Quantum Well Microcavities with Spatially Controlled Carrier Injection (S. Mestanza, et al. ).